As IVLP participants travel across the United States to various cities, they meet with Americans like Anita. This network of 80,000 mostly volunteer “citizen diplomats” accompany the participants to local meetings, host dinners in their homes, and share professional ideas and resources. “I always wanted a bed and breakfast,” Anita says with a chuckle. “It suited my personality, and I love entertaining.” As a citizen diplomat, Anita makes an effort to show off her city, even if it’s not included in the official program of events. “The most fun is the first time experiences. I take pleasure in their being here for the first time.” For example, she often takes participants to see wild west-style cowboy shootout performances, and she once had a South African participant who wanted to help shovel snow. Along with the pleasures of hosting, there are challenges, and time and creativity have helped Anita develop best practices. “The biggest challenge is always the language. Now, I use the iPhone translator for non-English speakers. It was harder 10 years ago, but you work it out. We use a lot of sign language. It’s actually kind of fun,” Anita explains. Another challenge is the special considerations for preparing food. Although she tries to cook typical American meals, there are certain foods that must be kosher or halal to accommodate the participants’ needs. Additionally, she has to consider allergies and whether participants are vegetarians. “We accommodate. A major part of it is making them feel comfortable,” Anita says. 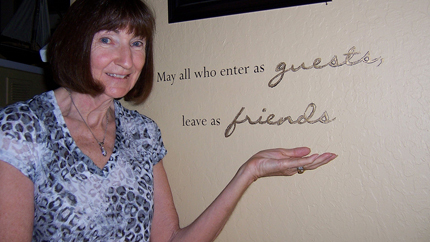 Leaving Anita’s home, participants truly do become friends.